The Sugar Shed, 41 Washington Rd., is open from 1 to 5 p.m. Saturdays and Sundays through March, providing everyone the opportunity to see tree sap transformed into maple syrup. Registration is also open for The Farm’s Community Supported Agriculture effort, which allows anyone to be part of the farming experience, with all of its challenges and the bounty of the harvest. By having an idea of how much support he’ll have when crops ripen, Mr. Berecz can accurately plant for demand and is grateful for the financial help in starting those plants. “People think of seed packets as costing just a little bit, but I spend $18,000 in seeds. Right now, we’re busy in the greenhouse this year, getting ready and hoping this summer won’t have the rain of 2018, which impacted farming on the whole of the East Coast and into the Plains. He noted that participation in a CSA helps people not only enjoy what is known as ultra-fresh produce, but to also discover fruits and vegetables they might not otherwise taste. 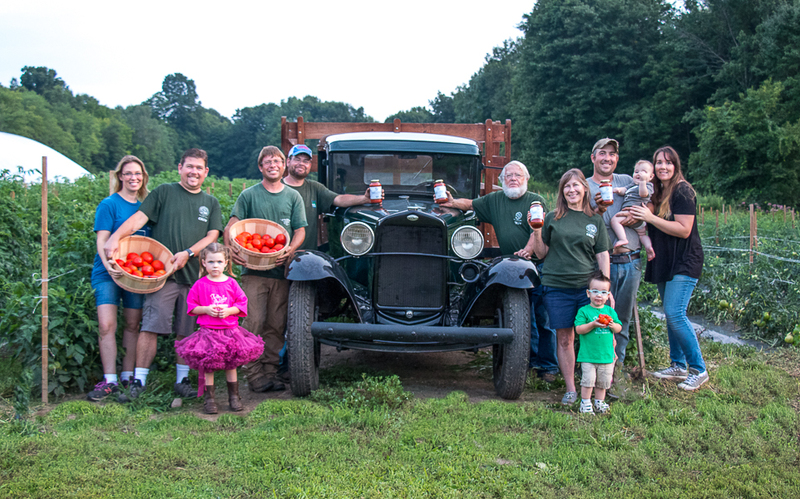 Celebrating his 30th birthday with a trip to France, Mr. Berecz came across a tomato so good that it became his mission to find the variety and see if he could successfully grow it in the Connecticut climate. Some plants thrive and customers come from Hartford and beyond for the Lebanese zucchini; a recipe for stuffing the vegetable with ground meat and herbs is on The Farm’s website at www.thefarmwoodbury.com. Mr. Berecz works 80 hours each week with his brothers Benjamin and Stephen, his wife, Amanda, his parents Louis and Carol, and a host of dedicated employees, including students from Region 14 and 15 and Oxford Public Schools. “Farming takes time and money,” Mr. Berecz said, acknowledging it is difficult to carve out a living for four households and he sometimes wakes up in the middle of the night with concerns or ideas on how to create a sustainable, realistic approach to local agriculture. There are many ways to find a meal, including restaurants, takeout dinners, and processed food. Mr. Berecz knows that, in addition to the available options that compete against him, he must work with other farms because he can’t grow everything. Where a CSA promises a bountiful basket of colorful produce each week, a harvest card is an alternative that acts like a debit card. The user prepays $100 and receives a 10 percent bonus, to buy whatever they like, when they like, including flowers, dairy products and meats at Woodbury Floral Design, 15 Hollow Rd. Mr. Berecz and his wife appreciate that support, which includes well wishes as the couple prepares to welcome their second child. The expectant father said, “It’s a crazy time now. We’re planting in the greenhouses, getting ready for Mother’s Day to help local clubs and non-profits sell plants to raise funds. “There are geraniums, hanging baskets, impatiens, marigolds and flower boxes. Maple syrup production is in full swing, of course, and the calving will start soon. He added, “Not many people aspire to becoming a farmer. Most people know how hard it is and we’re tied to the land with little time off. You have to love it and I think it’s in my blood. More information is available by calling 203-266-9149 and CSA registration is available until April 1.